Fleas happen. When they do, it is best to be prepared. Capstar Flea Killer is a flea pill for cats and dogs that is specifically designed to act quickly and hit hard, knocking out an entire flea infestation within 6 hours. Getting to work within a half hour, Capstar Flea Killer is a great way to take care of an infestation quickly and effectively. Sold over the counter and safe to use on cats and dogs four weeks and older, Capstar Flea Killer is a must have for any pet med kit. Capstar Flea Killer is associated most commonly with itching soon after taken. However, the itching is caused by the fleas as they die, not Capstar, and is temporary. In rare cases, cats react with hyperactivity, panting, vocalization, and excessive grooming. 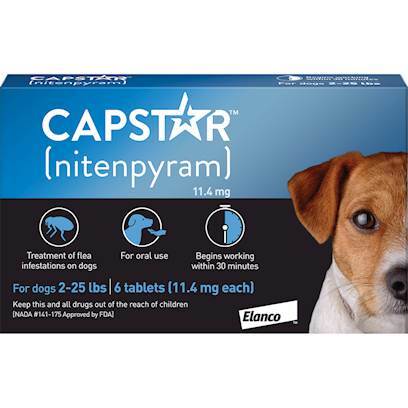 Capstar Flea Killer has no known adverse drug interactions and may be used with other products including antibiotics, corticosteroids, de-worming medications, heartworm preventives, shampoos, vaccines, and other flea products. Capstar Flea Killer may be administered orally, daily to weekly, mixed into food if necessary. See directions on packaging for proper dosage.